– In the opening practice sessions of the Honda Indy Toronto weekend, Spencer Pigot had one of the fastest cars in the field. He was turning speeds in the top five in practice but was caught out by changing track conditions during his qualifying run and would have to start 16th. Pigot wouldn’t back down after the tricky qualification session, racing his way into the Top 10 of Sunday’s race and even leading at one point. However, a late-race brush with the wall would result in a damaged suspension component which brought his race to an early end, just nine laps before the checkered flag. – The No. 21 Fuzzy’s Vodka Chevrolet crew made great strides between Friday’s first and seance practice session and Pigot finished with the 6th fastest time of the day. Every driver in the field turned their fastest lap during Saturday morning’s Practice 3 and all 23 cars were only separated by 1.3 seconds. Pigot bettered his position on the overall speed chart heading into qualifying with the 5th fastest lap of the weekend at 109.063 mph. 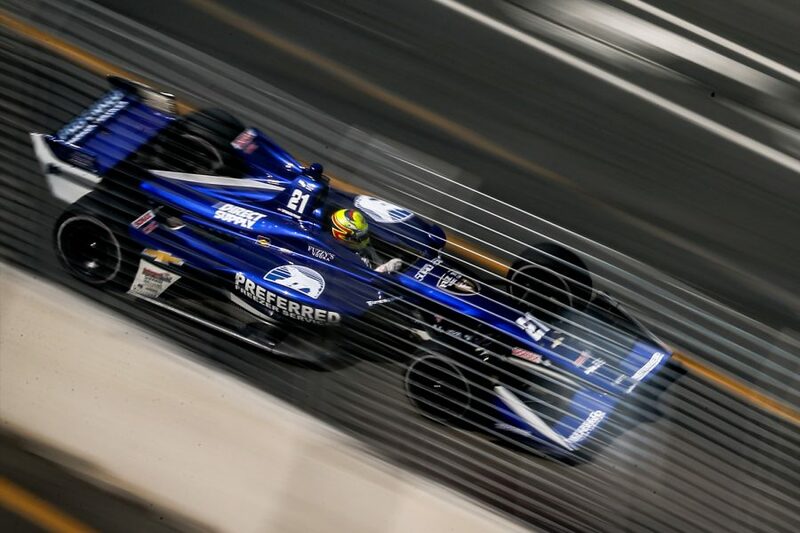 – In a twist, rains came to the 11-turn, 1.786-mile street circuit right before qualifying, then stopped just prior to Group 2 of Round 1, which included Pigot. Just as it went green, Pigot’s team made the call to start on sticker red Firestone Firehawks. Only two of the 12 drivers in Group 2 elected to go with reds instead of wets, shooting Pigot to the top of the charts where he remained as each lap was quicker than his last. In the final minute of the session, lap times decreased dramatically as the circuit dried up. Drivers who waited to switch to reds had tires in a more optimum condition and though Pigot’s last lap was his fastest, there was not enough speed left to contend with other driver’s newer reds. His lap of 106.833 mph had him starting 16th in Sunday’s race. – Pigot was one of only four drivers to start the 85-lap race on Firestone’s primary black Firehawks and fell back to 18th. However, drivers on red tires had to pit sooner, cycling Pigot up to 6th. Only a few turns before he was about to make his first pit stop, the caution flag flew and he was unable to make it into the pit lane before it closed. Committed to a two-stop strategy, he made his stop on Lap 29 when the pits opened. The timing of the pit stop under caution dropped him back to the rear of the field and after switching to red tires, Pigot was 17th. – Two more caution flags followed before the race went back to green for good on Lap 44. As cars involved in the cautions either fell out of the race or had to stop for repairs, Pigot again cycled forward. Just prior to his final pit stop, Pigot took the lead of the race. He led for one lap before making his stop on Lap 59. Knowing he would re-enter the race in traffic, the No. 21 Preferred Freezer Services crew elected to outfit Pigot’s car with red Firestone Firehawks. Pigot exited the pit lane in 10th, but passed his way into 9th the following lap. Takuma Sato made contact the wall two laps later, handing Pigot the 8th position. – On Lap 76, it was Pigot who brushed the wall coming out of Turn 11. He was able to make it around to the pit lane, but a broken wishbone on the right rear would bring his race to an early end. He would be credited with a 20th place finish. – The Verizon IndyCar Series will have an off-weekend before heading to Mid-Ohio Sports Car course in two weeks. Pigot and King will be back in their Fuzzy’s Vodka Chevrolets for the Honda Indy 200 the final weekend of July. NBC Sports Network will broadcast the race beginning at 3 p.m. on Sunday, July 29.